For that extra special feeling please choose our Superior or Finest quality option, with nicer fabric and high quality finishing, a lovely indulgence for only £4.99 Superior and £9.98 Finest extra to make that special day even more special. Product image above is of our superior product. 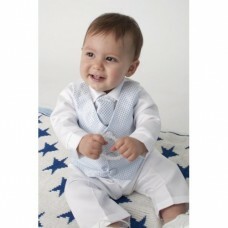 This extra special 4 piece Christening Suit is perfectly designed to ensure baby's day is as special as it can be. 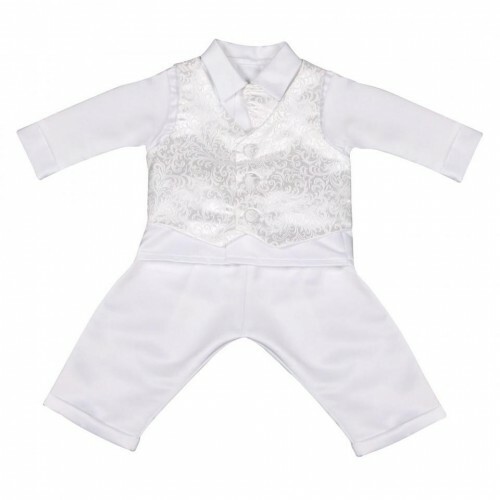 Made from 100% Polyester, this christening suit features a white paisley patterned waistcoat with a matching cravat, and white elasticated, satin look trousers with a full sleeve white collar shirt. The suit is also available to be hired for just £10.99. Please just choose the correct option. In order to hire the suit, please pay full price for the suit. You will be able to return the suit and obtain a refund, where we will charge you £10.99 per item and refund the balance. Please note we will not refund any postage costs. The items must be clean, unmarked and undamaged. Sorry we have to be strict on this policy. I hope you understand. "Hi it's Sally-ann, I spoke to you yesterday. Just a quick thank you for your help and faultless service, also to let you know the Tuxedo has been received. The quality of the Tux is spot on and the cost by comparison couldn't be matched. Thanks again for the quality service, I definitely won't hesitate in recommending you at any given opportunity"